Once there was a wicked witch. And then one day she decided to get married, and not to someone, but to a handsome prince. The only problem - all the princes were engaged. All of them were picked up by beautiful princesses. Back then a cunning plan germinated in her dark soul - to destroy a family happiness of all beauties, and to turn the princes into frogs unless and until some of them come to senses and want to become betrothed of the evil witch. She lulled to eternal sleep one of the princesses along with her servants. That's how the legend about Sleeping Beauty appeared. You will have to set free the frog-princes from Witch's captivity, to help them to get on to the beautiful brides to remove the witchcraft by kiss of love. But will you be able to discover all the secrets of Witch and restore the happy endings in fairy tales? 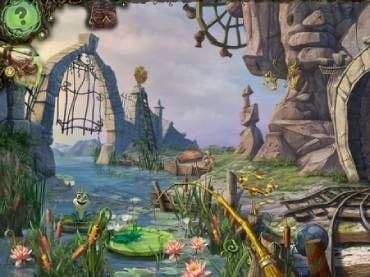 Free Game features: - Fresh approach on storylines of popular fairy tales; - Picturesque locations with designers' art; - Charismatic 3D characters; - Audacious humor; - Dozens of original brain-twisters; - 3 difficulty levels. If you have questions about Witche’s Pranks game, please contact us using this form.